If you are looking for an excellent walking shoe, check out our table of contents below to quickly navigate this page, and use the comparison table below to find the best shoe for your particular need. We've scoured the internet to find the best walking shoes for a variety of common problems people face, from bunions and arthritis to shoes for walking on concrete floors and for best-in-class ankle support. Walking is one of the healthiest most accessible forms of exercise. If you are looking for the best pair of walking shoes, whether you you are a man or a woman, the two recommendations above will surely suit your needs. ASICS makes a quality shoe and they have many raving fans who refuse to purchase anything else. The men's Neo 4 Walker comes in either black or silver, features a bunion window to accommodate walkers with bunions, and gel cushioning designed to absorb shock and provide an exceptionally comfortable work out. One satisfied user writes of the shoe having lasted for over a thousand miles of walking. They swap out the insoles with Dr. Scholl's replacements whenever necessary. It is a lightweight sneaker that comfortably flexes but is generous with its padding and cushioning to help maintain stability and comfort. Individuals suffering from planter fasciitis, arthritis and bunions have found be the ASICS Walker Neo to be an excellent option for them. The ASICS Women's Quick Walk comes in three different colors and is specifically designed to cushion the feet while you walk. Engineered with breathable mesh, a padded ankle collar for comfortable and snug fit and a shock-absorbing midsole. One woman writes of having recently had knee-replacement surgery and using this shoe to begin exercising again. Others commend it for being immediately comfortable right out of the box and being effective for handling plantar fasciitis and bunion discomfort. While these two shoes are certainly dynamic options, no shoe is a fit for everyone- It is sometimes worth purchasing a specialty therapy shoe if you have a specific medical difficulty. There are also specialty shoe stores that will help analyze and videotape your biomechanics while on a treadmill to diagnose the exact style and type of footwear that is the best fit for you. This can be the best option if you truly want to know that footwear you are purchasing is best for whatever medical or pain condition you are trying to address. Getting a brisk walk can be one of the healthiest and cheapest forms of cardiovascular exercise. If you require extra ankle support because of a medical condition or general weakness in the ankle area, consider the ankle support walking sneakers we recommended above. While the Alexio Ankle Support shoe is technically a basketball sneaker, if you really need strong support in your ankles while walking this could be a great option for you. Plus it's pretty stylish. Many basketball players who sprained her ankle severely will purchase this type of shoe instead of wearing braces or cumbersome tapes. This shoe provides dynamic stability for athletic performance, but if you merely need it to support your ankle walking movements- this could be a great choice for you. The women's Under Armour RTS boot is not technically a walking sneaker, but it is engineered to provide substantial ankle support. This women's sneaker comes in four different colors, and is currently priced at over hundred dollars. Interestingly, a range of consumers use these particular shoes-from relatively disabled individuals who have highly unstable ankles, two construction workers that have to climb ruse and walk-through homes to demolish by fires. Under Armour appears to be one of the few companies producing fashionable and functional work shoes with quality ankle support. 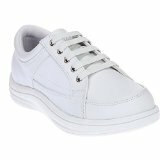 Most walking sneakers feature low-cut designs that do not provide sufficient ankle support. These two particular ankle-support sneakers could be excellent alternatives if you are looking for a way to bolster your ankle security while at work or at home. Our feet are complicated instruments: they have 66 joints, 52 bones and 200+ muscles, ligaments and tendons. When you are experiencing arthritis pain, it is essential that you make a healthy choice for your walking shoe. The wrong shoe will likely exacerbate the arthritis pain its sufferers feel in their feet, as well as their ankles, knees, and hips. Some medical professionals speculate that choosing the right shoe can help to reduce or even eliminate arthritis-related foot pain. The two shoes that we recommend here are known to be effective for arthritis sufferers, but they do not work for everybody. If you have arthritis-related foot pain, you may want to check in at a shoe store and try out different options to see which one is the best for you. The Orthofeet Sprint sneaker for men is specifically designed to reduce pain associated with arthritis. It has an innovative tie-less lacing system which enables you to lace up the sneaker without actually having to tie them. This is an excellent feature if you are experiencing arthritis difficulties in your hands. This sneaker also features a unique design that includes an orthotic-insole and special cushioning technology that is specifically designed to reduce arthritis as well as diabetes-related pain. Many users report excellent results from using this shoe- it is a bit more expensive than a traditional shoe, but if you suffer from arthritis it could definitely be worth the price. The Women's Orthofeet sneaker is designed to eliminate pressure points and provide a more comfortable experience for those suffering from sensitive feet, diabetes as well as rheumatoid arthritis. These therapeutic walking sneakers include a gel orthotic insole that produces a cushioned step with increased stability. Besides helping women with arthritis move more comfortably, some users report having purchased these arthritis sneakers for vacation trips that included high-intensity travel over cobblestone streets and for bunion pain-relief. Purchasing a quality shoe is the first step in both preventing and relieving pain associated with bunions. Shoes for bunions are primarily designed to decrease inflammation and strain of the big toe. Some general tips for purchasing a walking shoe for bunion pain-believe that you should never buy a shoe that is too small for your feet-this will only exacerbate the pain you're experiencing. There are also a variety of bunion care products you can look into purchasing-these can help supplement your footwear to decrease the pain your bunions are causing you. While these two walking shoes that we recommend here are widely credited for effectively handling bunions, everyone's feet are different. While these shoes may work for the majority of people, your own situation might be different. The InStride Dakota therapy walking shoe was designed by a team of podiatrists and pedorthists to provide a comfortable walking shoes solution for people who suffer from hammertoes, corn, bunions as well as diabetes-related problems. It features a Custom Fit System. What this means is that there are two extra, removable insoles that help provide a truly custom fit. This therapy shoe is designed to help manage as well as prevent the formation of bunions and is not an unattractive shoe, to boot. It comes in a variety of different with as well as to color options-brown and black. Make sure you understand the width that you need prior to purchase, as some users report having to return a pair before they found a with that was accurate and comfortable for their foot size. The InStride Dakota therapy walking sneaker is InStride's female version of the Dakota Therapy shoe. It features all of the same design and comfort functionalities, and also comes in black or white. They include three removable liner layers as well as extra long laces. Some reviewers have noted that the toebox is deeper than other shoes they have worn, with a rounded shape. As well, while it is not a visually striking a shoe, it does not look like a medical device the way some therapeutic shoes do. As we previously noted for the male version of the same shoe, getting the width and size right can take some adjustment. Some users even bought two different widths at once knowing that they would return one of the pairs of therapy shoes. In all, InStride shoes are unique therapy sneaker alternatives that for many people help manage the pain they feel in their feet and ankles. If you are experiencing back or foot pain from walking on concrete floors one of the smartest decisions you can make is purchasing a shoe that is designed to alleviate this type of pain. Cushion-soled walking sneakers can diminish the harsh impact of standing on concrete- absorbing the shock your body and spine experience every time you take a step at the worksite. The Wolverine Oxford work shoe is designed with compression pads incorporated into its soles to effectively absorb walking and working on concrete floors. The foot beds can also be removed if you have an orthotic that you would like to insert into the shoe instead. The customer consensus is, if you are on your feet for 13 or 14 hour days, these are a must-by if you prioritize comfort and safety. The Reebok 2.0 sneaker is recommended by waitresses that are on their feet continuously for 10 hours a day, six days a week. These shoes are enhanced with memory foam which makes them especially comfortable when you are working on a hard concrete surface. They come in black and white and also can be purchased in a variety of different widths​ to accommodate fit. These are great work and walking shoes without sacrificing comfort in the equation. As always, it's important to make sure you buy the right width- this will truly determine the quality of your experience with this rugged work shoe. If you or an elderly loved one is having difficulty getting around, one solution is to investigate more comfortable and functional footwear. Proper sneakers for elderly individuals can help to decrease the risk of falls. 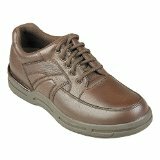 Some of the considerations to keep in mind when choosing a safe shoe for an elderly person, is that the upper heel collar should be firm for increased stability, the sole should have a strong textured grip to prevent slips, laces should be easy to tie tightly or Velcro straps for added ease of use. Unsafe shoes for the elderly will often have a wide-open heel, which does not provide strong ankle support,unstable high heels, and slippery non-gripping soles. The Propet Men's Life sneaker is an easy slip-on option with Velcro straps, a strong-gripping rubber sole, shock-absorbing midsole, a firm ankle-supporting collar. It also comes in a variety of different widths, which can help to ensure proper fit. The Proper Women's Slip-On it is probably the most popular elderly woman's shoe sold online, judging from what we've seen on various e-retailers. It comes in a variety of different styles as well as widths. The nylon collar provides a flexible but firm ankle support and the strong tread provides superior traction for walking stability. The customer consensus appears to be that they are extremely comfortable and good-fitting shoes that are even effective for women still in the workforce who are on their feet for 12+ hour shifts. 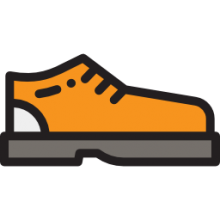 When choosing a walking shoe or sneaker for the elderly, important to purchase one that will be highly cushioned, extra stable, and have a strong rubber grip to protect against the possibility of falls. Walking shoes are essentially footwear that you use when you are walking, whether it be for exercise or just taking a casual stroll around your neighborhood. While there are specific shoes that are specially designed for walking, a running shoe, a tennis shoe or any other type of footwear can be used when walking. That said, as we have seen in the specialty shoe section above, it can be important to purchase a highly specialized type of shoe if you are suffering from arthritis, you need effective ankle stability and support, you are an elderly individual that needs a firmer shoe with a tougher tread, or you have some sort of medical condition or complaint that requires you to purchase a specialty therapy walking shoe. When discussing athletic shoes, they commonly come in three different categories: shoes designed for cross training, running or walking. When purchasing a shoe for daily walking, you want to make sure that the toebox at the front of the shoe gives you enough room for comfort. This is crucial because when you are walking for great distances, any minor aggravation can quickly swell to become a major one. As well, if you have a pre-existing medical complaints like bunions, for example, a shoe with a tight toebox is likely to aggravate your situation significantly. In general, you can expect to pay between $52 to $150 for a quality walking shoe- there is some variation when it comes to specialty therapy shoes. Whether you are looking to buy a particular brand like Asics, New Balance, ISstride, Reebok, Nike, or some other major footwear company, Most people will find a shoe that they enjoy and then purchase it over and over until the manufacturer discontinues it or comes out with a new model. Walking can be an incredibly healthy exercise that most anyone can participate in. While walking is for most of us a daily obligation, some people who practice power or fitness walking, commonly known as speed or aerobic walking, do so for the purposes of elevating their physical fitness levels or decreasing their body weight. What makes this style of exercise so great is that there is such a low threshold for entry- anyone can begin practicing it and seeing its benefits pay off relatively quickly if combined with a integrative nutrition plan designed by an accredited health professional. Try starting for around 10 minutes a day at a faster pace than you normally would. Reflector strips should be applied to your clothing so that cars and other types of vehicles can see you in the dark. Posture is also important- try to keep your back straight with a natural curvature, the shoulders should be down and your abdominal muscles should be lightly tensed. In addition to comfortable clothes and a good posture, try to do some stretching before you begin your fitness walking and then make sure to cool down after a workout. As the workout is winding down, start walking at a slower pace. Another tip- ignore the fashionable tendency to attach wrist weights to your wrists- these actually have the potential of stretching your tendons and elevating your blood pressure. You can swing your arms instead in a exercising manner in order to activate and work your muscles. You don't want to overdo it and swing your arms too wildly and end up injuring yourself, that would just be silly. Yet another interesting form is known as Nordic walking. This style of fitness exercise requires that you take along two walking poles which you use to strike the ground for every stride that you take as you ambulate. This style of walking actually burns more calories than traditional walking because the necessity of swinging the two rubber-tipped walking poles involves working upper and lower body muscles. This Nordic exercise is effective for individuals that have a tendency to slump over while they are at work, or in general while they are working- it has the potential to loosen tension in your shoulder and neck muscles. It can also help individuals with balance or coordination issues to walk more securely. Whatever style of fitness you take up, make sure you a quick yourself with a comfortable and functional shoe. You can find one online or at a local shoe store where you can perhaps get somebody to provide you a custom-fitted walking shoe for your particular needs. If you feel like you don't have time to exercise, and your daily walk to and from work just isn't cutting it, consider some of the following ideas to up your activity level during the day. Try taking your dog out-there's nothing better for man and dog to bond in the outdoor terrain. You'll find that you will bond with your animal and increase your heart health overtime. You can also join a local sports leagues-try out the YMCA to find a competitive basketball or baseball league you can participate in. This is a fun way of upping your activity and exercise levels no matter the weather outside. You can take the stairs-if you work in a office building, try skipping the elevator in favor for the stairs. You'll find that this is a pretty rigorous fitness exercise to climb up to your office. If you are driving somewhere, consider getting there on your own two feet instead. Or you can park halfway there and then hoof it the rest of the way. Instead of waiting around for dessert after dinner-go outside and move around. This is killing two birds with one stone. Instead of ingesting high calorie foods, you will be substituting that gluttonous consumption for something more helpful and useful to your body's long-term health. The next time you get on a phone call that you know is going to take a long time-try going outside and taking a loop around your local park. You won't even notice how much effort and energy you have expended while you are on the phone gabbing away with your friends or coworkers. If you've got a kid, and is always complaining that you and he don't spend enough time together, indulge him this once and take him to the local basketball courts. Basketball is a great way to burn calories and engage with your child which they will certainly thank you for later. Dancing is another cool way of surreptitiously burning calories and helping your heart health. Try joining a Latin ballroom dance class- if you are single, the added benefit is that you might meet some interesting people while you are dancing. If you don't manage to meet anybody, at least you've burned some calories!